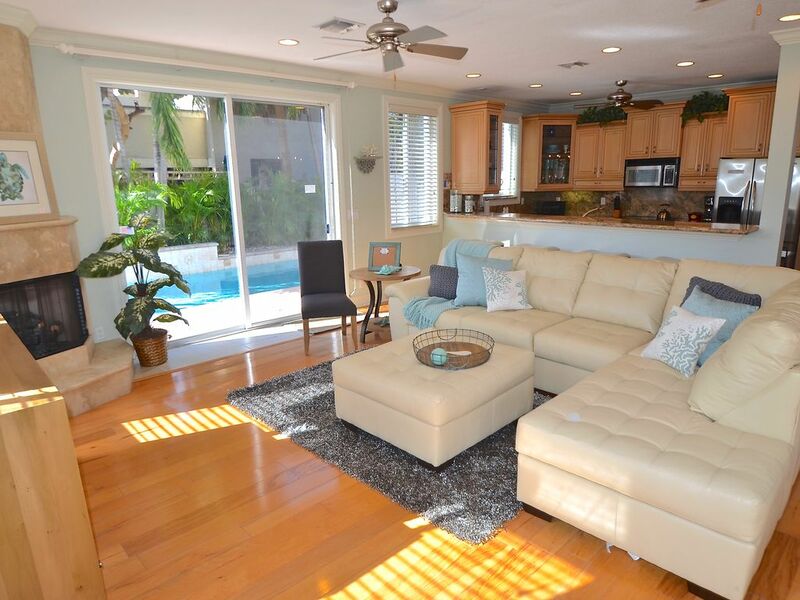 3 Bed 2.5 Bath Beach Villa w/Large Heated Pool & All New Furnishings!!! Welcome to Villa Miceli! This luxurious 3 Bedroom 2 1/2 Bathroom Heated Pool Beach Villa is situated less than two blocks from a wonderful beach portal in the picturesque, seaside community, of Lauderdale by the Sea, Florida. Villa Miceli has recently undergone a complete renovation that has left this ideal vacation villa with all new furniture throughout, including new televisions in all three bedrooms, as well as a new 55' LED High Definition television in the open living area. Villa Miceli truly offers the best of both worlds: a large private heated pool, the sparkling Atlantic Ocean (with direct beach portal access) less than two blocks away, the Lauderdale by the Sea Municipal Park (offering Basketball, Soccer and Children's Playground) one block away. The park is public but tennis courts are private there are public tennis courts 1 mile away. Also a full service shopping center (offering a Publix grocery store, Dunkin Donuts, CVS Pharmacy, etc.) one block away. You will not find a more ideal location for your getaway vacation. You are truly able to walk everywhere throughout Lauderdale by the Sea from the villa. This ideal vacation home is fully equipped with wireless internet, cable television in all three bedrooms and phone service. Ground Floor Amenities : Entering on the ground floor, you are greeted by a large and very open living area. As previously stated, the entire villa is equipped with all new furnishings. The living area offers a leather sofa with direct views of the 55' LED High Definition television w/dvd entertainment area, as well as the custom heated pool and lounge area outside. The large and very open granite kitchen is stunning and offers stainless appliances, custom wood cabinetry and a long granite breakfast counter with four (4) bar stools. The dining area offers a circular seating arraignment for up to eight (8) people. There is also a bathroom located on the ground floor. 2nd Floor Amenities : Upstairs you are greeted by the very private and large master suite, which offers a king size bed, two nightstands, dresser and a 42' television. There is also a private balcony off the master suite. The master bathroom feels more like a resort spa, offering a full size jacuzzi spa tub, a separate steam shower, two separate marble counters with sinks, a private make-up area and an enormous walk-in closet. In addition to the master bedroom and large walk-in laundry room, the second floor provides two guest rooms. Bedroom Two offers a Queen Size Bed, two nightstands and a wall mounted television. Bedroom Three offers two (2) Twin Beds with a new wall mounted television. There is a second full size bathroom on the second floor, as well as a large, walk-in laundry room with a full size washer & dryer. Villa Miceli is ideal for individuals and families in search of a relaxing getaway with the convenient accessibility to everything Lauderdale by the Sea and greater Fort Lauderdale has to offer. Villa Miceli is the very definition of a luxury vacation home. The home is fully equipped with wireless Internet, phone service and cable television in all three bedrooms, as well as a new 55' LED High Def television in the living room. Villa Miceli also provides additional linens, pillows and towels. An air mattress and pack-n-play are available upon request. Amazing location. Walk to everything. You can see the beach portal from the front driveway! This home is located on Washingtonia Street. There is a beach portal on Washingtonia Street and you can see it from the front driveway. You will walk about a block and a 1/2 to get inside the beach. the property location is about 10 minutes to Downtown Las Olas Blvd. Beautiful granite kitchen that is equipped with everything you will need! This is a 2 story home without an elevator. Villa Miceli offers a fantastic & large custom heated pool! Guests must be Twenty-Five (25) years of Age to reserve the vacation home We require proof of identification (a government issued photo id) We require a Damage Insurance or a Damage Security Deposit required is $1,500.00 and this amount is placed as a hold on the renter’s credit card. We require copy of credit card for Damage Deposit We require a list of occupants We require a list of automobiles used by the guest and parked at the vacation home We require a background screening We reserve the right to cancel any booking that doesn't meet house rules. The Villa was clean, spacious, and everything worked properly. The furniture appeared newer. Close to beach, downtown, and the grocery store! One thing I would ask is that when property management personnel are on site that they have some form of identifying insignia on their shirt or similar. Villa Miceli was private, comfortable and ideally located. Only a 5 minute walk to the beautiful beach. Spend the day meandering between the beach and the pool. Also just 10 minute walk to Commercial Blvd, the heart of LBTS with shops, bars, restaurants, night life. Location, location, location! Can’t be beat. The house has everything for family of five and Yorkie. Villa Miceli was a great place to vacation in Lauderdale by the Sea. The location is perfect. Close to the beach, restaurants and the grocery store. The pool was also very nice and it was great to have the choice between the beach and the pool. The pool was well attended, kept clean and warm. The house was clean and roomy. Our grill was not working the first night, a call was made and we had a new grill that day after it was determined it was not fixable. The kitchen could be stocked with supplies a little better ie more wine glasses. A little more attention to the small details would make the house perfect. We totally enjoyed our stay here as the home has more than enough room and is equipped with anything u may need. We r a family of 5 and we enjoyed our space, the outdoor area/pool and the area of Lauderdale by the Sea. It was super close to the beach and restaurants/shops. Any minor issues were looked after promptly. Pool/master bedroom sliding doors needed to be repaired but other than that everything worked, a/c very cool, kitchen had everything u need. Would return to this location again. Home,pool and location as good as advertised. Management provided excellent professional service. Lauderdale by the Sea is a quaint picturesque seaside town 1 mile north of the Fort Lauderdale strip. With a fishing pier, ancient coral reef, town circle with restaurants and shopping, lowrise building height restrictions, 8000 residents, this small beach town remains a sought after charming beachside community. Virtually everything you will need is within 2 blocks from your front door. The newly redesigned Lauderdale by the Sea Municipal Park, which offers tennis courts, basketball courts, soccer field, children’s playground and restroom facilities, is one block away. The Sea Ranch shopping center, which offers a Public grocery store, CVS Pharmacy, Dunkin' Donuts, Baskin Robbins Ice Cream, as well as many wonderful restaurants and boutique shops, is one block away. You can also walk to the downtown area, which offers entertainment, many restaurants and pubs, as well as ice cream stores, various shops and the famous fishing pier.